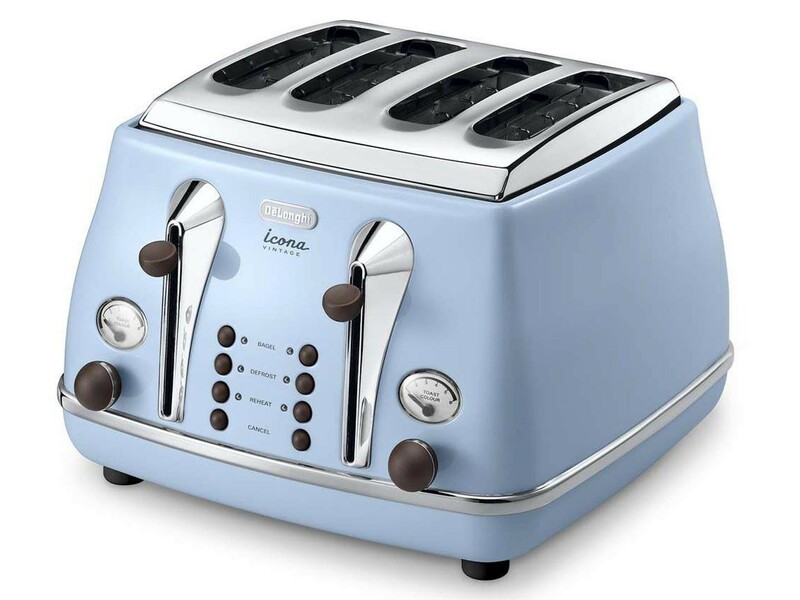 The DeLonghi CTOV4003.AZ 1800W 4 Slice Toaster comes in a beautiful azure blue colour and has a very nice vintage look. The elegant CTOV4003.AZ comes with a powerful 1800W making it toast your breakfast rapidly leaving more time to get ready in the morning. This can be used all 4 slots at once or you can use 2 slots individually so you can make 2 different breakfasts at once and not also not waste electricity when you only need to use 2 slots. The DeLonghi CTOV4003.AZ 1800W 4 Slice Toaster comes with all the modern features as standard like reheat and defrost. The hi-lift function is very helpful for when you need to collect your beautifully toasted crumpets without hurting yourself. The variable browning controls allow you to make everyone happy ensuring there is no burnt toast for those fussy eaters. The variable width slots also allow you to put your food in easier without having to struggle. There is a removable crumbs tray that neatly stores crumbs and keeps your kitchen tidy.